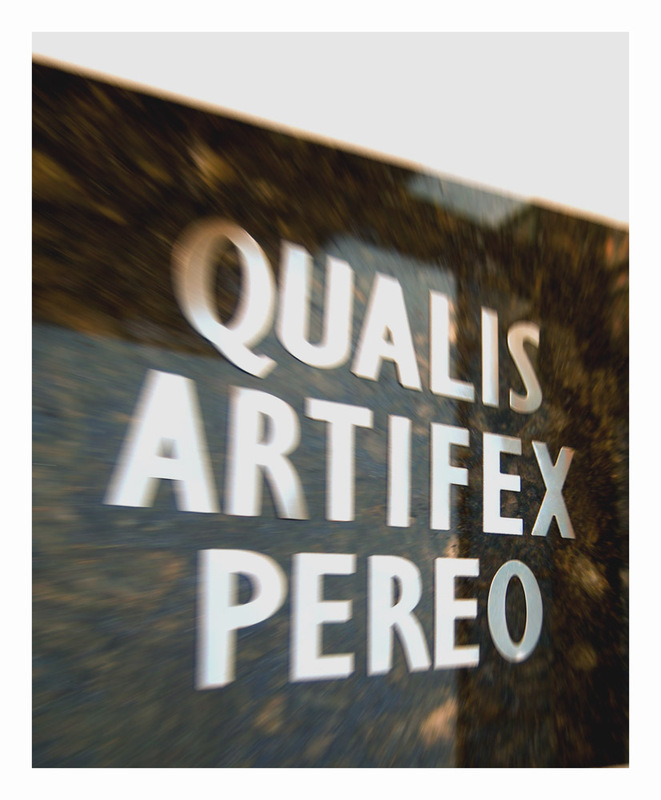 “Qualis artifex pereo” the Roman emperor Nero’s famous last words. The English translation of this quote I’m comfortable with is: What an artist dies with me (?). When I looked up each word on an online Latin to English dictionary, I drew up a translation that roughly is: qualis (what kind of an), artifex (artist), pereo (perishes, passes away). What kind of an artist perishes? I’ve found many other ways this statement is translated. What a great artist the world loses with my death. What an artist the world loses with me, or as what kind of artist do I perish. I have not seen any of these with a question-mark. I suppose this might be due to the fact that such punctuation wasn’t around (in ancient Rome) &/or most people/scholars don’t regard this statement as a question. I personally like to think of Nero’s last words as a question, a question asked after his death. All sum: what kind of artist was Nero? Well, he seems to have been a poet, actor, singer & charioteer. We also have the well known image in our mind of him “fiddling” (playing the lyre) & singing the “Capture of Troy” on the rooftop of the palace gazing down on the great fire of Rome. Was this a result of his artistry? Was this the 1st performance art—on a grand scale? Who knows? This scene, however true, IS how the artist/emperor will be remembered (whether its veracity is debated). Other unsavory images of the artist/emperor come to mind, the matricide of the crafty Agrippina, the persecution & mistreatment of the Christians, & other questionable behaviors. Again I’ll ask: what kind of artist died when Nero committed suicide? I’ll say not a very good one. I don’t really even see him as an artist (usually), rather, I see him as the worst of Roman imperial decadence. His creativity & supposed talent were somewhat overshadowed & obliterated by his monstrous character. Who knows, perhaps he was a great singer, actor & artist—I’ll never really know. “I believe that the artist doesn’t know what he does. I attach even more importance to the spectator than to the artist.” This quote of Marcel Duchamp’s seems relevant here, because it points to one important factor; how you will be remembered is not entirely in your grasp—even if you ruled the Roman empire. This question (What an artist dies with me?) becomes a question an artist (or anyone) can ask at the moment of death, but the truth of it will be how one is remembered is simply out of our reach. How will I be remembered? How will history judge me? As Duchamp seems to be saying, the artist doesn’t understand completely the effect s/he will have on an audience. The audience more or less completes the artwork, the missing variable (for a particular artwork, or the body of an artist’s work) is that it can only be finished with the viewer, and this variable is out of the artist’s control. I’m trying to reposition the question (What an artist dies with me?) to something more universal & general. How will anybody’s work be regarded when they are dead? Whose work gets forgotten, who will be remembered? Whose work will be overshadowed by their life’s (mis)deeds, their mistakes? How is someone remembered & for what reasons? A mediocre artist can be remembered & a great artist can also be forgotten. Who can say—either way, why or why not? Yes, Nero’s last words initially sound selfish & arrogant, but I believe that once the statement is deflated of its ego, there is a strange truth that is revealed. The truth is, how one is remembered is not (completely) under our own control. I am not claiming this as new idea, rather a little something to think about when regarding our own lives, the lives of others & even the life of Nero. Marcotte Madame de Sainte-Marie 1826, H. : 0.93 m. , L. : 0.74 m.
Cited above is all the info found (on the Louvre’s database) for the painting of Madame Marcotte by Ingres. Her name is hyperlinked to an image of the actual painting with a frame. I was searching around my digital pictures today & was reminded of her again. I drew this in ’07. When I finished, I think I showed everyone I knew, I was so proud of her. Nowadays she sits on our piano in a plastic sleeve–waiting. Years ago I saw a reproduction of her in a book on The Louvre. I fell in love right away. The master’s treatment of the brown satin, her hair & that gorgeous face had me at first glance. This is not a well known painting of his. More famous paintings of Ingres are of Napoleon, or of his Turkish women in the bath &c. That she isn’t too popular, made me love her more. I’m sure I wanted to draw this as an homage & to have a good challenge. Could I actually create a drawing that would come even close to the painted Madame Marcotte? Several things had to be just-right. The face, the fabric, the jewelry—all of it. 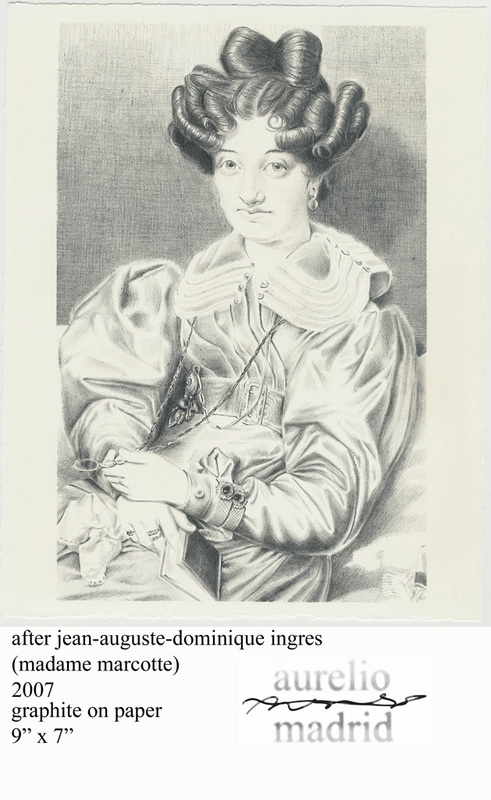 One doesn’t just come to Ingres & expect his secrets to be revealed at once. I had to conjure this out very slowly & very carefully. Each touch of the pencil had to be carefully thought out. It’s a way of seeing, isolating each fragment—it’s all subtlety. I had to love her. I was enslaved. While I worked on this I also tried to read up on Ingres. One issue that is always talked about is his distortions. This can be seen in his handling of the skin & hands (maybe her face too). Her hands seem to be too perfect, without knuckles & perhaps a little too white. Another distortion may be her lovely eyes, they look to be too big. All this considered, I’d say the distortions add to her beauty, her unusual look, her seductive charm. I have seen paintings of his where the distortions are a distraction. The C. d’ Haussonville portrait at The Frick Collection is a good example. Look at her right arm (closely) it’s growing out of her side! Don’t get me wrong, Ingres was the one of the finest painters in history, but like anyone (including me), he had his moments. “Four men and a game. What do we have here? Four men playing a game, the record-player is stuck on the start of the album, before the music. No words are spoken & the tension is high. I can’t make sense of the title (6′ 54″= six feet & fifty-four inches) & I can’t identify the game, maybe only they know the rules for the glossy black blocks. A child’s game with adult rules? The sand-timer is used twice, once to time a minute & the other to keep the sand from timing. We see one of the men get up & stare-out, sweating, worried. Do they even know each other? What man’s fate is in question? What is in question? At once a shadow covers the already dim light from outside. A cause for panic? The closing shot zooms in on a small window in one of the blocks & one man firmly covers it with another block. Then we speculate that they are in a larger game of chance. The music starts. Is it all one beyond control, beyond their grasp…? 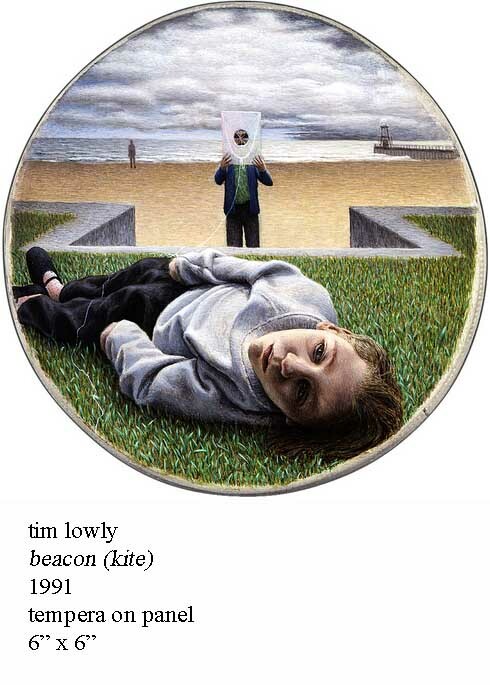 ...in this painting of Tim's, he is holding the paper kite as his daughter Temma lays on the grass. …found Tim Lowly online & asked if he’d be interested in doing an e-mail interview. With some luck he agreed. He is an incredible talent. He’s an artist’s artist! He’s also a professor, gallery director, & artist-in-residence at North Park University in Chicago. He is also a musician, singer, songwriter & photographer! In addition to all this, he is a father, husband & obviously a great friend to many! Aurelio: Thank you again for volunteering to answer a few questions. I initially want to know if you have any more to add to my bio on you? Tim: That’s enough for now. A: What do you teach, studio art, art history…? T: I’m fortunate to teach advanced painting and drawing. Additionally I co-teach senior seminar for art majors. Next year I will – for the first time – be teaching a Renaissance art history class. I don’t approach teaching very academically so I am a bit apprehensive about this class. A: I’ll bet you’re the kind of professor (indeed, a kind professor) that befriends students, long after you’ve been with them for a semester. I noticed that some of your photos look to be of former students. These also leads me ask about all the people in your artwork, most of them appear to be friends and family—including an emphasis on your daughter Temma. Is this right, are most friends & family? T: Primarily I work with people I know. Painting outside of relationship kind of floats away for me. While I don’t consider the work I do to be conventional portraiture I do hope for something of a “rootedness” in the reality of an actual persons life and – to some extent – appearance. A: I may not be looking close enough but, do you ever work with models? T: I will occasionally do a drawing from a model; usually in the context of teaching life drawing. You can find a few of these kinds of drawings on my Flickr stream. There is a kind of freedom in this kind of work that I enjoy, but I don’t think it is really my strength as an artist. A: I read somewhere that you (& your family) have an intense relationship with your daughter Temma. When I look at the artwork & photos you’ve done with her as the model, I am struck by how closely you have observed her, thought of her, & considered her. One set of drawings (Day to Day) features her lying down on a small couch with just some minor movements for each drawing (each day). Another painting titled “Temma on Earth” has her lying on the ground, it’s mostly gray & is featured on the cover of the recent Anathallo CD Canopy Glow. This image is one of the many, many intense & introspective ways you’ve presented her. I get the sense that you strive to depict the inner world of the mind (her mind/your mind) objectively, not unlike the Symbolists (?). Can you tell me more about the relationship with your daughter & how you depict her? Is this related to the way you depict other people? T: I’m not a very objective person or artist: my work with Temma reflects fairly subjectively on a long companionship with a person who in many respects remains a mystery to me. I’m not really attempting to depict the inner world of her mind, because I suspect I have only a scant understanding of what that world is. The Day to Day series is perhaps a good place to start talking about how I work with Temma (and by “with” I mean to imply a kind of collaboration although that is a difficult thing to quantify in relation to someone with whom one has very limited potential communication-wise). For me this series is essentially a kind of testament to the on-going, daily, existential nature of presence, relationship and care. That said, the number of drawings – seven – possibly suggests further readings or elaborations. One might think of an allusion to the creation narrative and make a metaphorical reading related to the nature of normal human development: reading this series as being about a kind of developmental stasis (specifically or more broadly). Or one could think of this as a kind of ironic twist on Pop serial imagery (like the work of Warhol): here the subtle changes, in work that initially appears repetitive, suggesting a kind of re-humanization. I’m sure there are other ways of reading this work, but I mention these in suggesting my interest in generating a multivalent work. My hope is to root work in the specific with a focus that is fundamentally marked by openness to the subject. While I certainly do my share of imposing “meaning” I am most happy when my work plays a catalytic rather than pedantic role. A: Thanks for the Camper-link, I felt I understood you (your family & your faith) more after reading the article. As I imagined, your relationship with Temma is profound & that is conveyed with your artwork—I know now, that it’s deliberate & multivalent. That you present her, in so many perspectives, causes a sense of caring & revaluation. Your struggle has not been in vain. A: I was also surprised by the interesting background story behind your & Sherrie’s name change. I read a magazine Art World & in the (Gareth Harris) interviews, the 1st question usually has to do with, what does your name mean (? )–or something like that. I have an interest with names too & I wanted to ask you about Lowly. My question was answered. Basically your name is a (loose) conflation of Grubbs & Rubingh (earthworms + peasant = Lowly, connected to the virtue of humility). I think this is great, what a beautiful concept, how creative! T: Thanks. In light of this I’m sure it is not surprising that over time I’ve come to find that the work I am most drawn to (like that of Antonio Lopéz Garcia) has a fundamental humility about it. Something extraordinary happens when an artist is good enough to get out of the way. A: …yes I’ve heard of him & love his art too. I’ve never been to (my namesake) Madrid, but whenever I think of the city–I have one of Garcia’s paintings in mind. A: I also liked what you said bout Van Eyck & Van der Weyden, that their art was “…a worthy labor, as opposed to the view of the artist as refined genius. Van Eyck’s motto was ‘As best I can’ [als ick can] and I saw that same kind of work ethic in his art that I observed in my father.” The sociologist Richard Sennett has written a book “The Crafstman,” based on the notion that within the craftsman “…the basic human impulse to do a job well for its own sake,” is elaborated & looked at from the angle that craftsmen haven’t disappeared, but have just been redefined & reexamined (by Sennett). I’d like to read his book soon, I relate to this notion that when making things, one shouldn’t overlook: simply doing a good job. I need to find out more. When I was young I didn’t understand this. I had some weird illusion that all these fine paintings & sculptures (in art museums), were not that difficult to make. It’s only when I begin to make an art object (in reality), that I saw just how tough it is to produce a decent “product.” I always cringe when I hear people say of art “…my six-year-old can do that!” I think to myself: can the child, not only produce the work of art (say a large scale painting) but also get it in a museum/gallery, have the hard-won notoriety &c. It is tough work making art & that is something to be respected, especially by the artist/maker. T: One of my “hats” at North Park University is “artist-in-residence” and on occasion, when I have been working on larger scale work (which won’t fit in my small studio on campus), I will work in the school gallery during the summer when there are no exhibitions. This is a very publicly exposed location and I like the way it allows for the “non-artist” to observe (and converse about) the way a painting develops. My hope is to de-mystify the practice and help dispel those ideas that a work of art somehow magically comes in to being when the artist is inspired. Lest it sound like I am some sort of diligent worker I should hasten to say that I am actually rather lazy. Every time I should be starting a painting I look for anything else that I can do. And when I am working on large work I struggle to step into the daunting task at hand. And every time I look at an especially arduous painting that I did in the past I wonder if I will ever be able to put that much into a painting again. And every time I paint I feel like I’m starting all over again. Actually the latter is probably more reflective of my philosophy of art making than an indication of laziness. A: Speaking of making artwork, the article mentions that you make/use a kind of tempera with gesso. I’d be interested in knowing a little more about this process. I have always wanted to use tempera, but have been intimidated by the egg-recipe & I never figured-out how to use it out of a tube. I know tempera allows for sharp details & that’s very appealing for my taste. What’s your process? T: I last worked with tempera around 1999. Between 1986 and 1999 I painted primarily with egg/oil emulsion tempera. Initially when I started working with tempera I used the classic egg tempera where the binder is simply egg yolk. After a while I wanted to find something that would yield a harder paint surface and which would varnish more uniformly. The emulsion I developed was based on research of different formulas and included stand oil and varnish with egg yolk. I really loved (and still love) the luminosity of tempera and it’s marriage of the linear and the painterly. As a very systematic technique it forced me to slow down and work more intentionally and contemplatively. I also learned about the unique characteristics of various pigments. Perhaps some day I will work with tempera again, but since 1999 I have worked with matte acrylic. This came out of the fact that I had been doing an under-painting for my tempera paintings with black and white gesso. Ultimately I realized I really liked the dry, fresco like quality of the surface. So I switched to matte acrylic. This also allowed me to more confidently resume some early practices of abrading the paint surface as I develop a painting, something that I would be much more hesitant to do with tempera. A: I’d like to wrap-up the interview by asking about your thoughts on your online presence. You have your website, flickr, myspace &c. do you have anything to say about the effort of getting your art to more people online? I have just started a more active self-promotion campaign by sending out packets to local galleries, by extension, I’ve tried to have more work available online, for people to see, in hope that this will help get my work to more people, faster. What I want to know from you is: do you think that the internet has enhanced your practice or just made for lots of extra hours, uploading files & general maintenance? I’ve tried to have a sense of gratitude about the internet, which is a tool to help me, that it’s also a great storage device, & that I run into lots of fun people who are willing to talk (or write, as you have here). 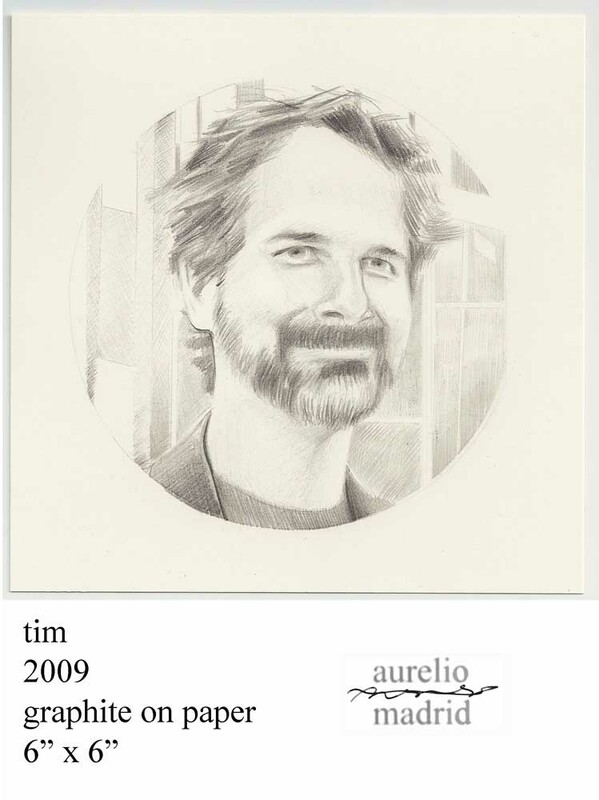 T: The development of the internet and digital reproduction of art have completely reshaped possibilities for artists. Certainly nothing replaces seeing an original painting or experiencing an actual exhibition. Certainly I have spent a ridiculous amount of time making my website, links section, flickr, myspace; time that might have been better used making art. That said, the interactive possibilities have been extraordinary. While there is a vast, even overwhelming sea of art and artists on-line there is a very real democratization of access to art through the internet. I especially love the possibilities of international networking that the internet affords. Of course it has its problems, but perhaps there will be an increasing re-enchantment of experiencing actual works of art after they have been initially known only via the web. A: You’ve been very kind to grant me this interview, along with all the extra time writing & thinking about it. Perhaps we’ll meet in person someday & talk some more about art & life…many thanks. T: Well, I am honored that you took the time to contact me and for such an engaging interview.